Heat moves from hot to cold at a rate dependent on the material and the temperature difference via some combination of conduction, convection and radiation. Materials also store heat, which has a short term affect on heat transfer. How these heat transfer processes work in the real world is somewhat complex. In this image, heat moves from atom to atom via conduction, examples of which are shown as yellow arrows. Heat will also move from the warm interior, thru the walls to the colder outside (not shown). Air heated by the stove, rises via convection (upward orange arrow), which is displaced by heavier cooler air (for example, coming off the window - downward orange arrow). Radiant heat is coming off the woodstove and also via sunshine thru the window, warming Henry and Henrietta, (red arrows). If the sun were not shining, Henry and Henrietta would be radiating heat from their bodies out the windows (dashed red arrow). 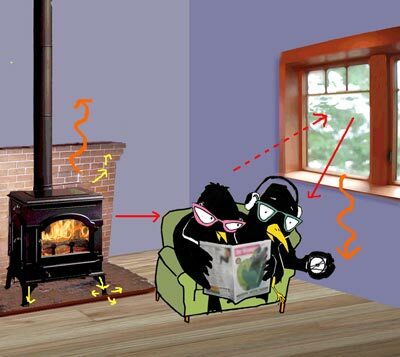 (Note: in real life woodstoves need a bigger surround, and crows don't read the paper). Conduction: when you put your finger in cold water, or touch cold metal, you are losing heat by conduction. Conduction is what happens when heat moves thru a material or from one material to another. It is the primary method of heat moving thru walls, ceilings and floors. Conduction is not affected by direction: it will move down just as well as up. For conduction, the relevant temperature difference is either on the two sides of a solid material, or the temperature difference between a solid material and the surround air. Metals and stones are very good conductors, wood & sheetrock are mediocre conductors, while fiberglass batting, shredded paper and Styrofoam are poor ones. The amount of heat moved is determined by it's U value (or its corresponding R value, which is just the inverse of U, eg R=1/U). You can look up the U (or R) value of a material in many published tables. The term radiation unfortunately has two very different meanings, one referring to particles and the other is shorthand for the term electromagnetic radiation. The muddle comes because nuclear reactions produce both kinds. Electromagnetic radiation can be divided into two general groups: ionizing and non-ionizing, or simply low and high energy. Ionizing radiation, like particle radiation can potentially kill you, but non-ionizing mostly can't. Non ionizing, includes radio, microwave, IR, visible and UV, wile ionizing includes x-rays and gamma rays. In buildings, we only generally encounter electromagnetic radiation in any quantity we care about in two limited bands: infrared (IR) and visible light. We generally subdivide IR into longwave and shortwave: shortwave comes from the sun, while most everything else comes from longwave. Radiation: when you stand in front of a fire, or in the sunshine, you are gaining heat by absorbing radiation. Likewise, when you sit near a cold window, you are radiating heat out that window. Radiation can occur from three sources: nuclear reactions (the sun for example), chemical reactions (burning something) and possessing a temperature above absolute zero. The correlation between temperature and radiation is limited to only the last case: that emitted by warm objects. This correlation exists because there is a direct relationship between the wavelength of the emitted radiation and the temperature of the object as one would measure with a thermometer. Objects whose temperature is in the range humans commonly encounter (say -30F to 500F (-30C to 250C)) emit in the IR band. If we get them hotter than that, say in an incandescent light bulb, or forging steel, or even your electric stove turned all the way up, the object will also emit some visible light. While we might not be able to easily see it, an object at 20F (-7C) will still emit IR radiation, and so even if you were to put it in a vacuum, it will still cool by radiation if its surrounded by colder objects. Radiation is only transferred thru a vacuum or a transparent medium1 and moves from hot to cold with no notion of up or down. A transparent medium is something like air, glass or water, and is not fully transparent--in that some radiation will be reflected, and some absorbed. In the case of air, transparency is due largely due to being extremely low density; in the case of glass and water, it has to do with how the atoms are arranged. Since all objects radiate, radiant heat transfer isn't really a one way transfer, but difference between the energy emitted and the energy absorbed from all surrounding objects, where "object" might be a molecule of air or water vapor. The lower the density of air and water vapor, the greater average distance a object will "see" other objects, essentially because the air becomes more transparent. If the air becomes transparent enough, radiation escapes the atmosphere, and almost nothing returns. The concept of "mean radiant temperature" means that if you take all the radiation coming to an object, its the effective temperature of a single object that would emit the same amount of radiation. Coefficient of absorption and emission: At a given temperature, how much energy a material emits depends on the properties of the material and is called the emissivity. This coefficient tells what percentage of the theoretical energy a material will emit that is actually emitted. Most common materials are in the range of .8 to .95, which means that they emit 80% to 95% of maximum. The main exception are metals, particularly shiny ones whose emissivity can be as low as .02, ie 2%. No matter the material, the energy that is released is spread over a small part of the electromagnetic spectrum centered around the long-wave infrared. For more information on this spectrum do a search for "black body". The flip side of emissivity is absorptivity. Combined with absorptivity is reflectivity and transmission: the three quantities must add up to 100%, and are the percentage of the incoming radiation that is absorbed, reflected and transmitted2. Opaque materials have no transmission, so whatever isn't absorbed must be reflected. For glass, the transmission is high and absorbtivity low, with the remaining being reflected. For opaque materials, the absorptivity tends to depend more on color than anything else (other than shiny metals which are highly reflective): light colored materials range from .1 to .4, darker duller materials .5 to .8, and blacks in the 90-98% range. Absorptivity is meant to apply only to radiation around the infrared spectrum, and so values for the absorptivity or emissivity of materials does not really apply in the gamma ray part of the spectrum. The other twist is that the special materials used to make photovoltaic cells also don't follow the rule because a chunk of the incoming energy is converted to electric rather than heat. If the energy being exchanged is all coming from a warm object, then the wavelengths will be all be the same, but if energy is coming from another source, for example the sun, the spectrum of the energy going is centered more around the visible part of the spectrum, while the energy going out is centered around the low part of the infrared spectrum. Solar collectors: these are made with special materials who absorptivity is well over 90% and whose emissivity is between 10% and 20%. Putting this coating on a metal strip causes the strip to get very hot, and then transferred elsewhere--for example to water. Cool roofs, radiant barriers: the flip side of this are materials with low absorptivity and high emissivity: they are good for reflecting heat. Some materials, like Aluminum foil have low absorbtivity and even lower emissivity. These will still reflect much energy, but will also heat up until the outgoing energy is in equilibrium with the incoming energy. The reflectivity of Aluminum foil is about 85% and since the foil will be uniformly warm, it will emit radiation from both sides of the foil. The reason these radiant barriers don't work when they have dust on them is because the dust has a much lower reflectivity value (and hence higher absorptivity). Low-E glass: these materials are reflective at the low end of the infrared spectrum, particularly across most of the spectrum emitted by warm objects. Then they are transparent to everything above there up to the UV part of the spectrum. This allows the solar shortwave infrared to come in a windows, but reflects any longwave back. For a discussion on radiant (hydronic) heat, see the radiant topic in the FAQ section. Convection: when hot air rises off a pot of boiling water, or hot pavement, this is called convection. Convection is the movement of a hot gas or a hot liquid toward a colder one, although the movement is actually due to gravity, not heat transfer. What happens is that warm air (or water) is less dense than cold, so the cold sinks and the hot air rises. In convection, heat only moves up because it is carried by the lighter air. A pot of water is heated by convection more than it is heated by conduction. Convection is responsible for the common misconception that heat rises. In the common forced hot air heating systems, a fan moves hot air to an outlet placed low on a wall, and convection causes that air to move upward to the rest of the room. When the air coming into a room is significantly warmer than the room, it can float to the ceiling an collect there, causing great temperature stratification, especially with tall ceilings. In this case, the air near the ceiling can be 20 degrees warmer than the air near the floor. The amount heat movement due to convection is governed by the temperature of the air either above a source of warming, or the temperature of the air below a source of cooling, because its really not heat movement at all, but rather the movement of air of a different density. Convection is generally a very rapid way to move heat. Specific heat: energy absorbed by a material raises its temperature. The specific heat of a material is how much energy is required to raise the temperature by one degree., or more accurately, how much energy is required to raise a unit weight (eg a pound or kilogram) by one degree. By the pound, metals store very little, wood and stone store at least twice as much, and air stores even more. But because a cubic foot of air weights very little, while a cubic foot of stone or water is quite heavy, by unit volume, water stores the most, followed by stone, then metals, with air a distant last place. For the purposes of thermal mass, we want materials with high absorption rates (so they gather the sun's energy), and high specific heat (so they also store it). Evaporation although this is not a heat movement method (the heat actually moves by conduction and convection), the process of evaporation of water absorbs a large quantity of heat, and hence moves much more heat than normal conduction & convection of air would have. This is why sweating is so effective, and the principle on which swamp coolers (or any evaporative cooler) is based on. The following are some example properties of materials. When a range is given its because the value varies with exactly what kind of material (ie hardwood .vs. softwood), and in the case of air or water, the R value is dependent on there being no convection. 1: How we describe radiation in heat transfer is probably not quite the same as in physics, because on the atomic scale even materials that are "touching" really are only sort of touching, hence presumably an atom a few nanometers from another atom could probably only actually transfer heat thru radiation rather than the vibration energy moving thru its electron cloud. Regardless of the actual physics, we still call it conduction. 2: I suspect absorptivity only applies to electromagnetic radiation in the infrared to visible spectrum. Lower energy, particularly radio passes thru many solid materials. Microwaves are absorbed by some but not all. Higher energy (ie starting somewhere in the UV band) have completely different interaction with materials.